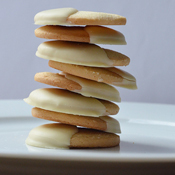 A perfect balance of light citrus flavor and rich white chocolate. These irresistible cookies get their extraordinary flavor from pure Sicilian lemon oil - the recipe is simple and the ingredients are the finest available. 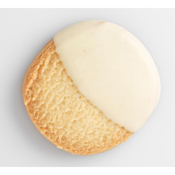 To complement the delicate texture and flavor of the cookie, each one is hand-dipped in ridiculously rich, melted white chocolate. Organic. Island Bakery Organics is a small family-run business from Tobermory on the Hebridean Isle of Mull. There they make their range of delicious organic biscuits by hand, using the highest quality ingredients. The farms on which they are grown are truly environmentally sustainable, and preserve rather than destroy the habitats and wild animals that share the landscape with them. 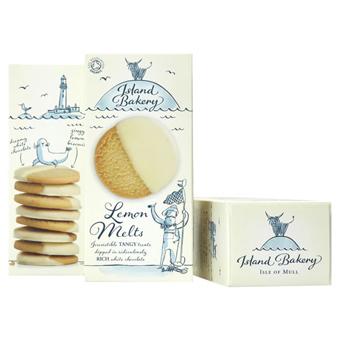 Island Bakery tries to source as close to home as we they can for ingredients where it's possible - flour, oats and butter all come from the United Kingdom. 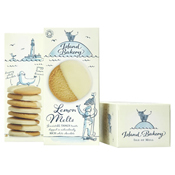 Island Bakery biscuits are made as close to a homemade recipe as possible, resulting in a cookie of unparalleled taste.